Local sports and recreating activity is important to NMT. Participating in organized sports has been shown to improve health, fitness and academic performance in participantes while also relieving stress and teaching important lessons like good sportsmanship, teamwork and perseverance. 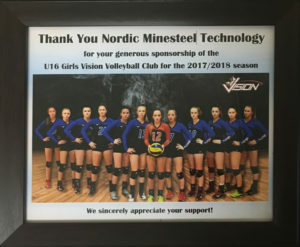 We are proud to sponsor the U16 Girls Vision Volleyball for another season.